"Opened relatively late in the Second World War, Wratting Common, or RAF West Wickham as it was originally known, was first occupied by an advance party of 34 airmen who marched in from RAF Stradishall on 30 April 1943. Next day, S/Ldr. W. K. Young arrived to assume temporary command of the new Station, and a steady build-up of personnel began. The new arrivals included a detachment of 113 airmen of 4768 Works Flight from Stradishall, whose task it was to assist in the rapid completion of the building programme at West Wickham. For Station defence duties, a detachment of twenty RAF Regiment gunners was posted in, and administrative staff arrived from RAF Ridgewell, which was in the process of being handed over to the United States Eighth Air Force. By the end of May 1943 RAF West Wickham was ready to receive its first squadron, and 90 Squadron, equipped with Stirlings, duly arrived from Ridgewell on 30 and 31 May. At the same time, Gp. Capt. A. Earle took over from S/Ldr. Young as Station Commander. 90 Squadron commenced operations from their new base almost at once. Aircraft from other airfields were now beginning to visit West Wickham; one which landed on 9 June 1943 was Mosquito LR498 of 1409 (Met.) Flight at Oakington, which had been forced to abort an operational flight due to a fire in the fuselage. On inspection, a hole in the tailplane was found, probably caused by the aircraft's entrance hatch breaking away during flight. The navigator had been dragged partly out of the Mosquito, injuring an ankle slightly, and he was attended to by the MO before the aircraft took off for its base. Another visitor, a Spitfire which had come to West Wickham for fighter affiliation practice on 13 July, crashed on take-off, the undercarriage being raised to stop the aircraft running into the perimeter hedge. From July 1943, West Wickham, like many other Bomber Command airfields, was used for the storage of Horsa gliders. At least nineteen of these large aircraft arrived during the month, and became a familiar sight in the streets of Haverhill as they were being delivered on Queen Mary low-loader vehicles. After assembly by a detachment of men from No. 2 HGU, they were parked, initially at least, in front of the control tower. 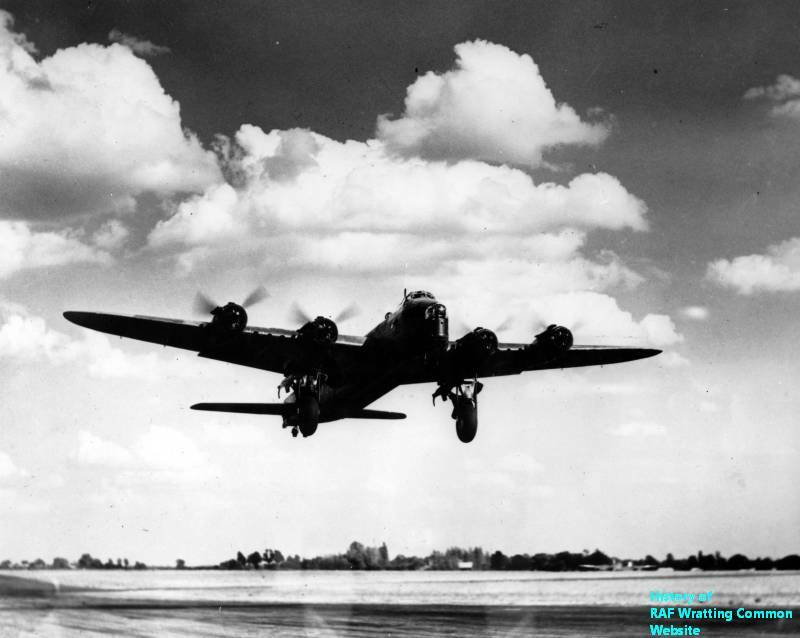 A horrific accident occurred at West Wickham on 4 July 1943, when a Stirling, BF504, which had just taken off, side-slipped from about 500 feet, hit the ground and exploded. Two airmen sitting outside the temporary Sick Quarters drinking tea after their midday meal saw it happen and raced to the scene, only about 200 years away. Screaming aircrew, their clothes alight, were rolling on the ground in agony, and the two airmen rushed from one to another putting out the flames. Two died there and then; the other five were put in the ambulance which left in great haste for the RAF Hospital at Ely, the only place equipped to deal with serious burns. On the way, the ambulance was held up at a railway level crossing, but when the circumstances were explained, the crossing keeper stopped a train and let the ambulance through. Three more of the aircrew had died by the time the ambulance reached the hospital, and the remaining two were carefully off-loaded. The two rescuers had suffered burnt hands, which were treated by the ward sister. After an hour, the two men began their weary journey back to West Wickham, in the sad knowledge that the last aircrew had just died. Next day, one of the ambulance men was put on a charge for "taking an ambulance without proper authorisation", and was awarded seven days 'Confined to Barracks'! Visits by aircraft based elsewhere continued and included the arrival on 30 July of two P-47s from the USAAF 78th Fighter Group after an offensive sweep over enemy territory. The undercarriage of one aircraft failed to lower, and it made a wheels-up landing. Later, the other P-47 continued on its way home to Duxford. During August 1943 a Stirling from 1657 CU at nearby Stradishall caused consternation on the 16th when it made an emergency landing, with two engines smoking, during take-offs for a Bullseye exercise. Two days later two Halifaxes landed after an operation on Turin; one, coded VR:A, was from 419 Squadron at Middleton St. George and the other, coded WL:P, was based at Tholthorpe with 434 Squadron. Meanwhile, administrative changes were taking place. Gp. Capt. Earle, the Station Commander, was posted on 25 July 1943 and was succeeded by W/Cdr. W. V. Clube. A few weeks later, due to a number of misunderstandings which had taken place, RAF West Wickham was renamed RAF Wratting Common, with effect from 21 August 1943. Enemy action, or the threat of it, was taken seriously at Wratting Common. Following an attack on RAF Feltwell by a Bf.210 on 10 August 1943, an order was issued to all at Wratting Common that blackout regulations would be overhauled. At the same time, everyone was reminded of the danger of handling anti-personnel bombs, particularly the 'butterfly' type. Later, a Stirling from Stradishall was shot down by just such an intruder near Wratting Common; it crashed at Withersfield, but fortunately no crew members were killed, although they all suffered burns and shock. Shortly afterwards, on 1 December 1943, the Station was reorganised as a Conversion Unit within a Conversion Base, with three Wings; SHO, Training and Servicing. New buildings were now being opened at quite a pace. Station Sick Quarters moved from its original building on the WAAF site to a permanent home on No. 3 Site on 17 October, and on 1 December the new Photography Block was brought into use. On 24 December the Gymnasium opened and was put to good use for a Christmas Eve party that very evening, and just after Christmas the Education Block came into use. During January 1944 the Squash Court was opened, work began on a B.1 type hangar for use by the Civilian Repair Organisation, the machine gun range came into use and a new briefing room and rest room were occupied. A new telephone exchange was taken over on 23 February 1944 although there was no heating or lighting, and next day the bulk fuel installation, likewise deficient of electricity, was commissioned. At the same time a new boiler house began operating, providing water to, among other places, new showers for officers and sergeants. The new Station Church, St. George's Chapel, was dedicated on 5 March, and finally, on 7 March, a new Synthetic Navigation Centre was put into use. At the end of March 1944 the airfield was closed for a few days while repair work was carried out, but this task was hampered by a 3" fall of snow, which thawed quickly to create a great deal of mud. However, mud or no mud, the Horsa gliders which had been stored at Wratting Common since the previous July now began to leave. The first eight were towed away to Greenham Common by eight Dakotass on 30 March to be made ready for use in the forthcoming invasion of Europe, and twenty-two more Dakotas arrived on 1 April but only took away six Horsas between them! One suspects an April Fools' Day Joke had been played on someone! On 5 April six Dakotas collected four Horsas, and the last six Horsas left, each towed by a Dakota, on 10 April. After the Horsas had gone, the airfield was subjected to some "shooting-up" by four yellow-nosed P-47s of the USAAF's 375th Fighter Squadron from Bottisham on 12 April. Two of these intruders carried codes E2:A and E2:J and may thus be identified as 275404 and 275249 respectively. Another P-47 from the same Squadron enjoyed a similar bit of fun on 22 April; this one was coded E2:V or E2:X and is therefore less identifiable at this distance in time. By this time, activities outside working hours were well established and well patronised. Educational activities consisted of classes in languages and mathematics, lectures on such subjects as 'Life in the Soviet Union' and 'Ante-natal Clinics' (this one aimed at the WAAFs, one assumes), and correspondence courses. The Station Concert Party, always very active, gave performances of 'Wratting Revue' at Wratting Common and at Stradishall. Sporting activities were, of course, popular among both men and women, although WAAFs who cycled to Haverhill to play tennis that summer complained of feeling exhausted by the time they got there, indicating that East Anglia is not as flat as generally supposed! Swimming in Haverhill's pool was also a popular event. On the operational side, tragedies had an unfortunate habit of occurring at Wratting Common as at any other airfield. 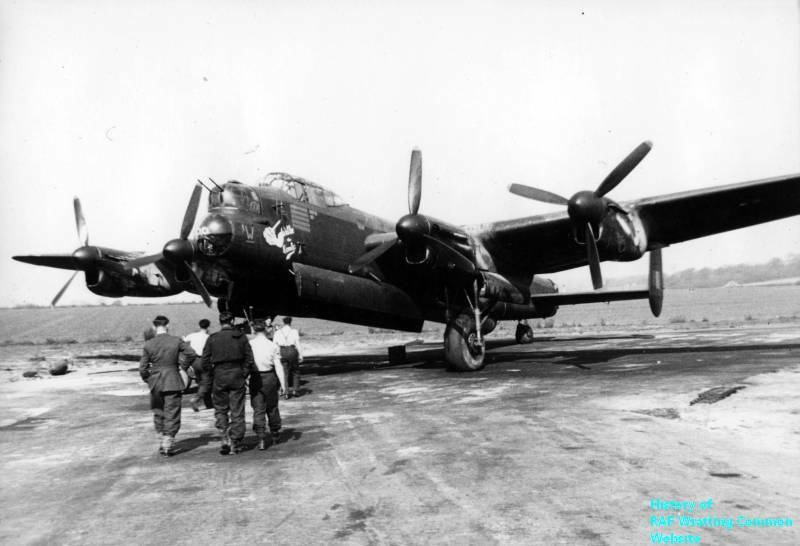 On 6 June 1944, for example, Wellington XII JA619 of 69 Squadron, based at Northolt, ignored an Aldis Lamp signal from the runway controller refusing permission to land, belly-landed and collided with Stirling BF470 of 1651 CU and burst into flames. Two people died in this horrific accident. All the buildings in Part 1 of Holloway Bros' contract had been completed and handed over by 9 June 1944. Whether any further building work of any consequence was carried out at Wratting Common is uncertain. Problems with the surface of the runways still cropped up, though, and rectification work continued, but, to the annoyance of those concerned, some of the labour force was sent to Stradishall to work there, which did not improve the situation at Wratting Common! In order to strengthen 1651 CU's training programme, 31 Base Flying Instructors' School was formed at Wratting Common on 24 June 1944. This was essentially a non-flying unit which provided lectures on captaincy, airmanship, planned flying, flying control procedures and accident prevention. The fifth anniversary of the formation of the WAAF was celebrated on 28 June by a church service, followed by a party at which a two-tier cake, a real luxury in those days, was cut. The Station Commander congratulated the WAAFs on the good work they did, and mentioned the scepticism expressed by some members of the regular RAF when the WAAFs first came on the scene. Since then, he said, the WAAFs had fully proved themselves, and the WAAF contingent at Wratting Common now formed 12% of the total strength of 1770. Among the continuing stream of aircraft visiting Wratting Common was a Walrus amphibian, W2677, which was on final approach to runway 13 on 17 July 1944 when the engine cut due to lack of fuel. This unusual aircraft came to a halt with its undercarriage in the ditch and its forward fuselage across the Carlton to West Wickham road. It was not too difficult a task for RAF men, assisted by a number of local small boys (one of the authors of this book among them) to pull the Walrus free and to push it along the road to the nearest hangar for attention. During the last week of July 1944 the Cementation Company was at work on all three runways in an attempt to effect much needed repairs. The workmen no doubt had a ringside view of a V.1 flying bomb which had the temerity to reach Wratting Common on 26 July. This V.1 came to earth at 2.25 p.m. that day just twenty yards outside the airfield boundary, close by the hangar alongside the Haverhill road at a spot marked today by an isolated clump of bushes. There were, thankfully, no casualties and the only damage was a few broken windows. October 1944 was a month for diversions to Wratting Common of aircraft returning from operations and unable to reach their bases. No less than nineteen Lancasters from 576 Squadron at Elsham Wolds arrived on 6 October, while on 22 October two B-17s from Nuthampstead appeared. Next day was 'Halifax Day': ten from 424 Squadron at Skipton-on-Swale, three from 427 Squadron at Leeming and three from 429 Squadron. Major changes at Wratting Common were now once again in the air, and a chain of events began with the departure on 1 November 1944 of an advance party comprising an officer and fifty men of 1651 CU to Woolfox Lodge, where the unit was to convert onto Lancasters. They were followed in a few days by the rest of the 1651 CU personnel, accompanied by Gp. Capt. M. V. M. Clube, who relinquished command of RAF Wratting Common on 10 November to take up the same position at Woolfox Lodge. Next day, Wratting Common's new Station Commander, Gp. Capt. L. J. Crosbie, arrived. Unusually severe weather during January 1945, with hard frosts, snow and poor visibility reduced flying at Wratting Common considerably. Clearance of snow from the runways put a heavy burden on ground staff, but morale remained high in those closing stages of the War, and activities outside work were well supported still. In February the first well-attended meeting of the Open Forum Discussion Group in the WAAF NAAFI took place, and 'Wartime Marriages' was the subject; a further meeting later in the month considered 'Women's place in Industry after the War'. With the end of hostilities in sight, Gp. Capt, C. E. Morse took over as Station Commander on 20 March 1945. A slackening of activity on the Western Front meant that 195 Squadron was called on to attack fewer targets, and at the end of April 1945 began the highly rewarding task of dropping food to the near-starving Dutch people. VE Day came on 8 May, and Orders of the Day issued by Air Comm. J. Silvester OBE, the CO of 31 Base, were read over the Tannoy system by Gp. Capt. Morse. That evening celebration dances were hurriedly arranged, and, much to the credit of all concerned, there was no necessity for disciplinary action, which no doubt disappointed the 'Snowdrops'! RAF Wratting Common seems to have been particularly well organised and disciplined Station, as it was only beaten by RAF Feltwell in the Sunderland Cup contest held in May 1945 for the best all round Station in Bomber Command. Even after the contest took place many men and women were busy cleaning up the Station for a major inspection on 22 June 1945 by the AOC of 3 group, AVM R. Harrison CB CBE DFC AFC, accompanied by the CO of 31 Base, Air Comm. Silvester and Gp. Capt. H. E. Hills OBE. After inspecting a Guard of Honour and a number of sections they lunched in the Officers' Mess and then took the salute at a parade on the main runway. The AOC expressed pleasure with, in particular, the WAAFs and the officers of the 195 Squadron, and in spite of the very hot day, during which tar on the runway melted, the deportment of all ranks was seen to be of a very high standard. The AOC also remarked that the clean and tidy Station compared favourably with many others and proved that it was possible to bring the standard of temporary hutted camps up to that of more permanent Stations. 31 Base disbanded on 24 July 1945 and RAF Wratting Common became a self-accounting Station, with responsibility for RAF Birch and RAF Gosfield. A complete reorganisation of Wratting Common was then put in hand, but was slowed down by the demobilisation of a number of personnel. The release system was running very smoothly, but an acute shortage of domestic staff developed, only relieved by employing men and women from other trades. Educational & Vocational Training became a major function in the Station, and was well patronised by those who wanted to improve their educational standards before leaving the Service. By early August 1945, 195 Squadron had completed the tasks it had been carrying out since the end of the War in Europe and on 14 August it was disbanded. Steps were then taken to revert to peacetime standards of dress, parades and Station activities, and most people responded suitably to what must have been unaccustomed practices to many of them. Demobilisation proceeded apace, and when, on 26 September 1945, RAF Wratting Common was transferred to 47 Group, Transport Command, the total strength was 68 officers and 1002 other ranks. On the same day, Gp. Capt. Morse left to take over RAF Mildenhall and S/Ldr. W. L. Farquharson took his place. The intention at that time was to use Wratting Common as a base for one transport squadron and a Transit Camp and minor alterations were put in hand at the end of September with this in mind. By 5 October, Stirling Mk. V transport aircraft of 51 Squadron, based at Stradishall, began to appear at Wratting Common for 'circuits and bumps' practice, as did an Oxford, probably from the same squadron. Then, at the end of the month, 51 Squadron, with 4051 Servicing Echelon, was fully detached to Wratting Common to allow runway repairs to be carried out at Stradishall. While at Wratting Common, 51 Squadron aircraft handled up to 800 passengers per week. Many RAF personnel were now being demobilised and as no replacements were drafted in the Station strength rapidly reduced, although morale remained high. Site No. 5 was prepared by 4647 Works Flight for aircrew use during December, and on 5 December the 'top site' was evacuated, all the WAAFs moving into the 'lower site' to conserve space and fuel. The lower site was somewhat damp, and an extra fuel allowance had to be made! The WAAF NAAFI was closed on 29 December and use was then made of the WAAF Sick Quarters as a rest room. Newly redecorated and with new curtains, this was felt to be a great improvement on the old building. During January 1946 51 Squadron and most of 4051 SE returned to Stradishall, leaving enough men behind to service a few remaining Stirlings, and on 14 January Wratting Common became an accommodation satellite of RAF Stradishall. The last Stirlings returned to Stradishall in February, but three of 195 Squadron's Lancasters still lingered on, being worked on by mechanics from 54 Maintenance Unit. Moves to dispose of surplus barrack equipment and technical stores began during the month, and an order was received on 4 February stating that all remaining WAAFs were to be posted away. Thirty WAAFs left on 27 February for Stradishall "..... with heavy hearts and happy memories ..... ". The Spring of 1946 brought a new type of aircraft to Wratting Common - the AVRO York, with which 51 Squadron at Stradishall had begun to re-equip. Four of them came each day from 25 to 28 March to carry out practice landings due to continuing problems with capacity at Stradishall, but at the end of March the Air Traffic Control section at Wratting Common closed down due to lack of 'trade'. The Station strength was now down to 220, including eight WAAF cooks and their two officers who had still not left as no replacements could be found. Sites Nos. 1 and 4 closed down at this point, and Site No. 2 was prepared for use by German prisoners who were expected to arrive in April. This was still not the end of RAF activity at Wratting Common, though. During April 1946 a ground-based conversion course was started for the benefit of aircrews converting onto the new York aircraft, and on 6 April No. 2 Section of 1552 (BABS) Flight, comprising ten officers and forty other ranks under the command of F/Lt. L. S. Clark arrived from Stradishall to work in conjunction with the ground course. The control tower having closed down, control facilities of a basic nature were provided by members of the Flight. After a frustrating three-week period during which shortages of spares and equipment came to a head, the Flight took its two Oxford aircraft back to Stradishall by the end of April 1946. The German prisoners, 76 of them, arrived as planned on 6 April and began work at Wratting Common and at Stradishall. At the end of that month Station strength was down to 16 officers and 131 other ranks, plus 96 of 51 Squadron's personnel still on attachment. 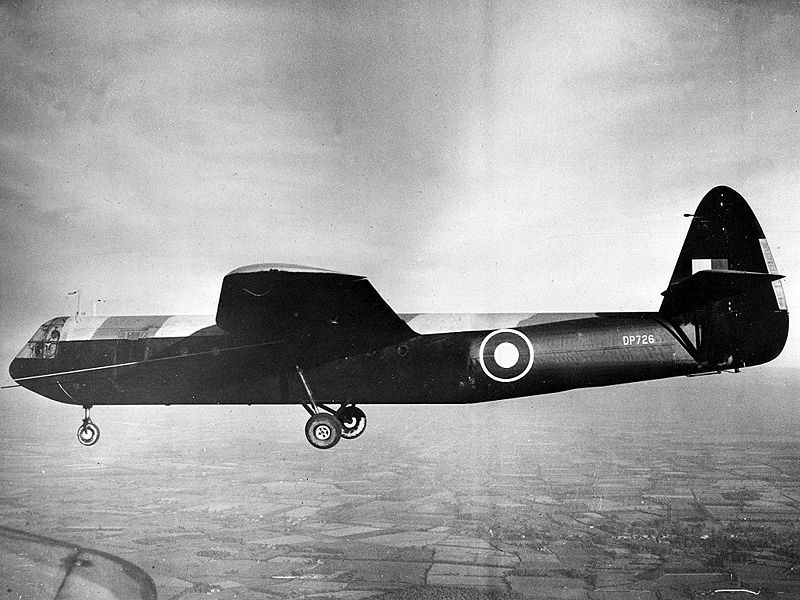 Training flights by York aircraft continued spasmodically, the last recorded being during the first week of June 1946, when six aircraft spent four days at Wratting Common. Since the last aircraft left Wratting Common, the airfield has, like many others, reverted to agricultural use. So that the men and women who lived, worked, sweated blood, and in too many cases died at Wratting Common will not be forgotten, a memorial has been erected close to the Weston Woods Farm entrance to the airfield. Made of granite with a carved inset of slate, the memorial was unveiled and dedicated on 28 May 1989, and forms a fitting reminder of the activity which took place close by nearly fifty years ago."